These tasty tarts are sure to become a new summer favourite. 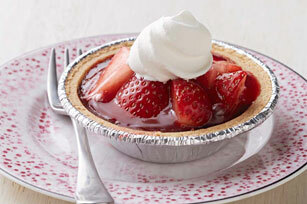 Featuring fresh strawberries and a touch of chocolate, you can't go wrong with this strawberry-chocolate tart recipe! Microwave chocolate and 1-1/2 cups Cool Whip in microwaveable bowl on HIGH 1 to 1-1/2 min. or until chocolate is completely melted and mixture is well blended, stirring after 45 sec. Spoon evenly into crusts, adding about 1-1/2 tsp. to each; spread to evenly coat bottoms and sides of crusts. Refrigerate until ready to use. Mix sugar and cornstarch in medium saucepan; gradually stir in water until blended. Bring to boil on medium heat, stirring constantly; cook and stir 1 min. Remove from heat. Add dry jelly powder; stir 2 min. until completely dissolved. Pour over strawberries in large bowl; stir to evenly coat strawberries. Spoon into prepared crusts. Refrigerate 2 hours or until firm. Serve topped with remaining Cool Whip. Substitute 1 ready-to-use graham cracker crumb crust (9 inch) for the mini crusts.